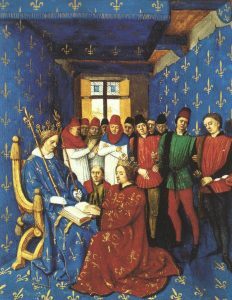 In the late thirteenth century and early fourteenth century the economy and population of France flourishes. The Kings of England try and hold on to the Duchy of Acquitaine from the Kings of France. The Papacy moved to Avignon. Picture: Homage of King Edward I of England (kneeling) to Philip IV (seated). As Duke of Aquitaine, Edward was a vassal to the French king. Painting made in 15th century.